I’ve decided it is time to start sharing product reviews here on my site as well as on Youtube. I have been asked enough times to do written reviews like I did on Small Camera Big Picture that I can’t ignore it any longer. Maybe I should re-phrase that. I haven’t been ignoring you, it has just been quicker to shoot a video review or unboxing and upload it to Youtube vs. writing a review in addition to the video. Let me preface this write up with a little observation that I have made over the last few years. I have noticed that the vast majority, certainly over 90% of camera users, never bother to upgrade their camera strap. It is something that admittedly I never had considered until one day on vacation in the Florida Keys I had this “moment of awareness” . My family and I were standing in line to take a family photo at the big marker on Key West that denotes the southernmost point in the United States when I noticed something. I saw dozens of black nylon straps that said, “Nikon”, “Canon”, “sheep”, “no style”. Haha, well ok, maybe not the last two, but you get the picture right? People where dressed fashionably, had their designer shades on, nice handbags etc…But an ugly nylon camera strap w/ manufacturer branding on it. NOT the height of fashion and style right? When we got back home from vacation I spent quite a bit of time looking online at camera straps. I knew what I was looking for, but I wasn’t finding it. I had a list of requirements that was simple enough. 1. Leather. Preferably something locally sourced from within the USA. I know, picky me. 2. Hand crafted one at a time. Why hand crafted? This is going to be not only a functional item, but it is a LUXURY item as well. Remember, I wanted to get away from the mass produced nylon ugliness of manufacturer supplied straps. 3. Good looks. Just because it is made of leather doesn’t mean it will look good automatically. If that were the case I would have turned an old belt into a strap. I wanted something that was DESIGNED by an artist. 4. Functional as well as fashionable. The two sadly do not always go hand in hand. So with that strict list of requirements I began my long search. It went through the entire summer and fall with no luck. Then one day I was chatting up a fellow photographer on Twitter ( https://twitter.com/MrKal_El ) when the subject of my search for leather straps came up. He mentioned HIS Tap&DYE strap and that somehow led me to an older article on the Phoblographer website where he had written a review of this stunning leather camera strap. It was pretty much lust at first sight. Let's take a quick look at the Legacy Neck Strap. It arrives in this cool recycled paper envelop with the company name and logo stamped on it. When you open the envelope you are greeted by a cloth bag containing the strap. Upon removing the strap we find it wound into a coil and bound by red leather cordage holding a tag denoting the color of the leather and what options your strap has, as well as the date it was made. Pretty slick packaging. Once you have the strap uncoiled you will find that it is indeed a hand crafted piece of art. The attention to detail put into the cutting and finishing of the leather is what one would expect in a piece of couture clothing. While the leather is stiff at first since it is new, mine ha come to soften up as the last few weeks have gone by. I expect over time it will become even more supple and luxurious to wear. Details abound on this strap as well. It has the company name and strap model type (Legacy) hand embossed on it and the strap even sports little "bumpers" to prevent the connection rings from rubbing on your camera. In addition to receiving the Legacy Neck Strap I also received the Legacy Hand Strap which you can see below attached to my Olympus PEN E-P5. As with it's longer brother, the hand strap is also created with that same level of craftsmanship found in the neck strap. These are indeed pieces of fashion that function like you need them to. I was supposed to have a Youtube video right here that further walks through the two straps but I think I have angered some internet God somewhere because I have had the upload fail twice now. When I DO succeed in getting the video up I will shoot out a tweet to let you know! I might suggest following me on Twitter @MacDonald_Photo and subscribing to my Youtube channel to ensure you get updates when new content becomes available. 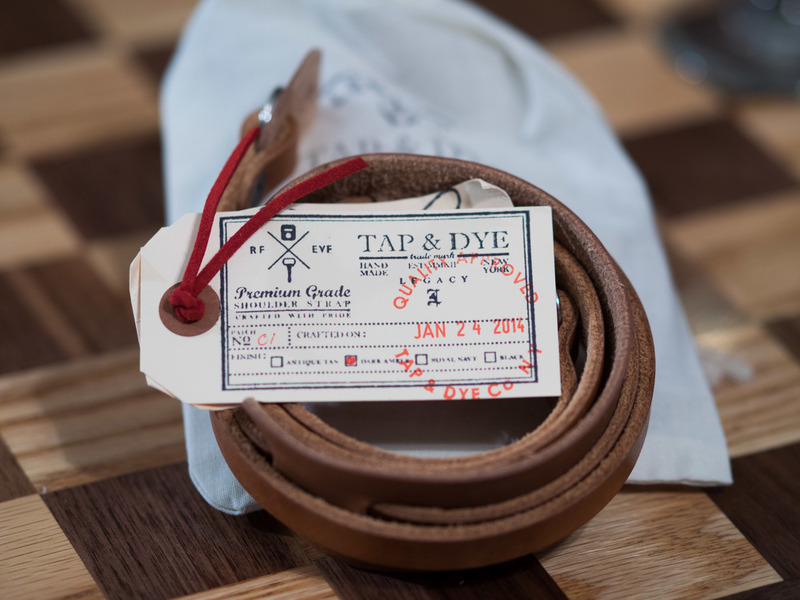 I hope you enjoyed this brief write up of the Tap&Dye Legacy Neck Strap and maybe I'll hear from you that you too have had your search for a great leather strap has come to a beautiful end with the purchase of one of these straps!